A wind consists of methane. It burns very well. Biogas is produced as a result of biological enzymatic processes. The main components are methane and carbon dioxide, both of them odorless. The gas occurs such as marsh gas: as a result of fermentation (anaerobic process) of organic material such as manure, sewage sludge, organic waste. As residue remains in the wet end material: digestate. Many farms equipped with biogas produce their own energy (or more). They are also immediately delivered of a manure problem. For a good fermentation is between 25° and 60°, optimally 37°C required. A portion of the proceeds (or solar energy) is needed (to heat the tank) using a hot water coil or heated (horizontal or vertical) mixing propellers. Production on a small scale is therefore in our climate not profitable. In parts of Africa, India and Pakistan it can. 1 cubic meter digester tank feeded daily with 6 kg. (literally) blended feedstock and 6 liters of water gives, after fermentation for 10 to 20% residual dried residue and one cubic meter of gas per day. With 20 kilo of manure per day a family can cook and do the evening light with it with one or two gas lamps. Four pigs or two cows is sufficient for this. The gas may need to be washed to avoid odor by burning. Since the composition and pressure of the gas are different from natural gas or LPG are special burners, lamps or generators needed. BiogasFrom the end of the 19th century until after WWII, wellspring gas was won by peasants for lighting and cooking in many Dutch polders. The oldest gas source was "in the month of August 1870 in the yard of Mr. A. van den Kooy Rotterdam's way to Delft " unlocked. Around 1850 Wouter Sluis, a farmer from the Beemster, discovered that the spring water, when it surfaced, was milky white at first, and later became clear. This was due to gas bubbles that turned out to be flammable. In 1894 he and his partner Jan Lankelma put a plant on the market that could separate wellspring gas from Nortonwellspringwater. The wellspring gas system is characterized by a black boiler in a brick pit, to collect the methane from the soil. The boiler came up due to gas pressure. To increase gas pressure, weights were placed on the boiler. A drain pipe with hose leads the gas to the farm. There were wellspring gas heaters, lamps, street lights, stoves. Estimates of the number of source gas installations vary from 4,500 to more than 10,000 sources. Wellspring gas is formed from the pleistocene by slow anaerobic degradation of organic matter at a depth between 25 and 80 meters. It consists mainly of methane, with a small proportion of nitrogen and carbon dioxide. It is geologically young gas: the formation started one to two million years ago. Natural gas (also largely methane) comes from deeper soil layers and is much older, up to 300 million years. There are three types of biogas plants 'fixed- dome’, ‘floating drum' and 'balloon'. Biomass comes in a large tank through a supply low above the bottom inside. An overflow carries excess moisture (to the garden). Drives a reverse, appropriate barrel on it that is pushed up by the gas. On the barrel there is a pipe with a hose to bring the gas to the combustor (cooking, water heater, lamp). The weight of the barrel determines the pressure on the gas. 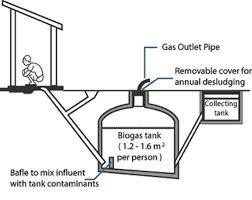 The material should be well mixed and blended to obtain continuous amount of biogas. Too much or too little fertilizer inhibit the growth of bacterial colonies, and results in low and irregular gas yield. On the internet are lots of movies and animations available from simple barrels and brick arches that seem to work flawlessly. In hot countries. Since it is feasible on a large scale would actually every neighborhood have its own installation and gas. Dog turds are worth money! a system where the sediment without much hammering can simply be removed to the compost heap. And I do not want to explode or burn often. If someone has such a working model, I 'd really like to see. Anyone?